Key Takeaway: Turkey is unraveling America’s anti-ISIS partner in northern Syria in order to position itself as a major power broker in planned operations to retake Raqqa City. Turkish Armed Forces (TSK) crossed into Syria to seize the ISIS held border town of Jarablus alongside numerous Turkish- and U.S.-backed Syrian armed opposition groups on August 24. The operation, titled Euphrates Shield, is a turning point in American-Turkish relations and the war against ISIS by fulfilling longstanding American demands for more Turkish involvement in the anti-ISIS fight. Euphrates Shield also aims to prevent the expansion of Kurdish control along the border, however. The U.S. ordered the Syrian Kurdish People’s Defense Forces (YPG) to withdraw to the east bank of the Euphrates River in accordance with Turkish demands at the start of the operation. Turkey is leveraging Syrian opposition groups it trusts in Jarablus and intentionally sidelining groups that joined the Syrian YPG-led Syrian Democratic Forces (SDF), bringing U.S.- and Turkish- backed opposition factions into direct conflict with the American-backed SDF. The SDF opposed the Turkish incursion and attacked the joint Turkish-Syrian opposition force on August 27. A U.S. defense official announced that the two sides agreed to a “loose” truce on August 30. An unidentified Turkish military source, however, subsequently denied the existence of any such agreement. The Turkish intervention has meanwhile inspired local resistance against the SDF and YPG in Sunni Arab areas including Manbij City, south of Jarablus, and the northern Raqqa countryside. Turkey may exploit this local resistance to unseat the SDF from Manbij City and replace it with a military force that opposes the YPG. Turkey is unraveling America’s anti-ISIS partner in northern Syria in order to position itself as a major power broker in planned operations to retake Raqqa City. Turkish Armed Forces (TSK) crossed into Syria to seize the ISIS held border town of Jarablus alongside numerous Turkish- and U.S.-backed Syrian armed opposition groups on August 24. The intervention brought the TSK and U.S. backed opposition forces into direct conflict with the Syrian Democratic Forces (SDF), America’s primary ally in the anti-ISIS fight. Turkey notified the U.S.-led anti-ISIS coalition, the Syrian regime, and Russia about the offensive, which it titled “Operation Euphrates Shield.” Turkish Special Operations forces led a joint military force into Jarablus, including an armored battalion from Turkey’s Second Army and as many as 5,000 Syrian opposition fighters from groups based in the northern Aleppo countryside including: the Sultan Murad Brigade, Suqour al-Jebel, Jaysh al Tahrir, Jabhat al Shamiya, Nour al Din al Zenki, Faylaq al-Sham, and Ahrar al Sham. ISIS mounted little resistance to the attack, instead withdrawing southwest to the town of al Bab. SDF fighters rejected the Turkish intervention as an “occupation” and attacked the joint Turkish/Syrian opposition force. The Turkish intervention meanwhile appears to have emboldened local elements to resist the SDF openly. Sunni Arab elements in Manbij and the Raqqa countryside issued statements rejecting the SDF because of the YPG’s goal to establish an independent Syrian Kurdistan. Turkey likely will continue to advance south in order to unseat the SDF from Manbij and position loyal Syrian opposition forces as necessary ground partners in the operation to retake Raqqa City. Turkey is leveraging Syrian opposition groups it trusts in Jarablus and intentionally sidelining groups that joined the Syrian YPG-led SDF. Local SDF groups from Jarablus declared the formation of the Jarablus Military Council on August 22 and stated their intent to seize Jarablus. The leader of the Jarablus Military Council (JMC), Abdussatar al-Jadir, was assassinated the following day. 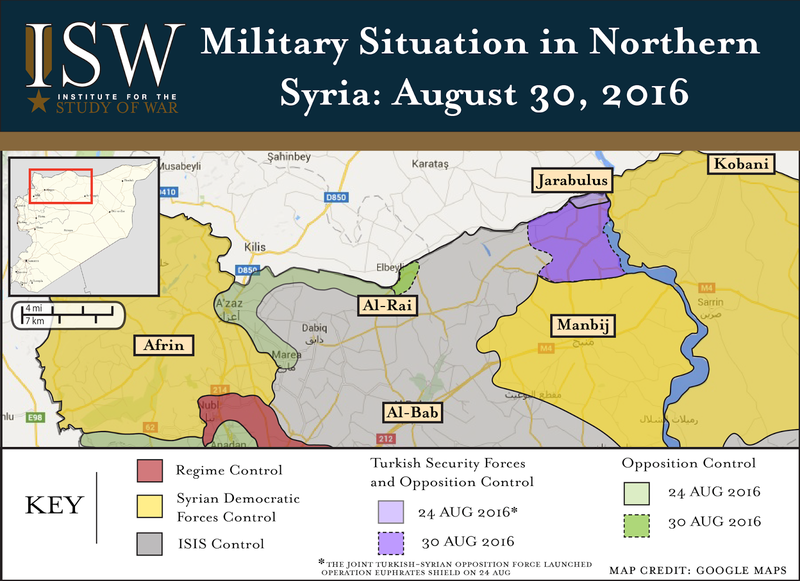 The JMC accused Turkish intelligence and attacked the joint Turkish/Syrian opposition force on August 27. Turkey launched airstrikes against JMC and SDF positions south of Jarablus in response and has maintained an active air campaign targeting the area. The joint Turkish/Syrian opposition force advanced south, seizing over a dozen villages and reaching the Sajour River by August 29. The JMC nonetheless continues to marshal support from the Aleppo countryside. The SDF-linked Manbij Military Council announced its support for the JMC on August 27. Prominent Manbij Military Council (MMC) member Kataib Shams al Shamal deployed to reinforce the front line south of Jarablus. A delegation of tribal elders in Manbij later declared its support for the JMC on August 28. The escalation between the joint Turkish/Syrian opposition military force and coalescing SDF elements south of Jarablus have redirected the focus of the SDF’s Sunni Arab fighting force at a time when the U.S. intended to prepare for operations to retake Raqqa City. Turkey will likely attempt to unseat the SDF’s Manbij Military Council next. The SDF formed the Manbij Military Council to recapture Manbij city on April 5. The SDF’s Manbij Military Council did not include the original Free Syrian Army-affiliated Manbij Military Council, which ISIS displaced in 2013. Turkey’s intervention emboldened the original Manbij Military Council and elements of the local population in Manbij to oppose the SDF openly. The original Manbij Military Council released a statement on August 28 rejecting the SDF and calling for shared control with the SDF over Manbij city. Residents of Manbij reportedly also issued a letter rejecting the SDF on August 28. Rising local dissent in Manbij follows a statement by Sunni Arab tribes in the Raqqa countryside that pledged to fight against the YPG in the area. Turkey may capitalize on local resistance to the SDF to recapture Manbij and install the original Manbij Miltiary Council. The commander of the U.S.-and Turkish-backed Sultan Murad Division, Col. Ahmed Osman, appeared to confirm this possibility. He stated that the Euphrates Shield offensive was “certainly heading in the direction of Manbij,” claiming that the YPG force in the area had not withdrawn from the city. Col. Osman stated that he expected Turkish-backed opposition groups would be able to seize Manbij within “a few days.” Turkey expanded its involvement after the SDF began to resist the intervention and appears willing to sustain an increased deployment. The TSK sent ten additional tanks and the same number of armored vehicles on August 25 and another six tanks after hostilities escalated on August 27. An unnamed Turkish official stated that Turkey would “continue operations until we are convinced that imminent threats against the country's national security have been neutralized” on August 25. The official added that Turkey could be willing to increase its total deployment in Syria to 15,000. 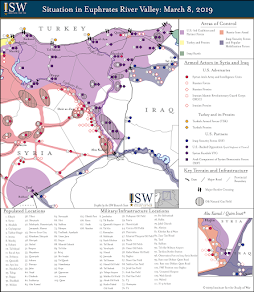 A U.S. defense official later announced on August 30 that the Turkish and SDF forces reached a “loose agreement” to cease fighting and instead “focus on the [ISIS] threat.” It remains unclear if the tentative truce will hold as an unidentified Turkish military sources and an unidentified Turkish-backed opposition commander subsequently denied the existence of such an agreement. Operation Euphrates Shield demonstrates Turkish President Recep Tayyip Erdogan’s willingness and ability to use military force to prevent the creation of an independent Syrian Kurdistan along the Turkish border even after an aggressive purge of the TSK following the failed July 15 coup attempt. The total initial Turkish deployment was close to 450 troops including 150 Special Forces plus 200 soldiers from the armored units and additional soldiers responsible for coordinating Turkey’s close air support and artillery support. Turkish Special Operations Forces under the command of Lieutenant General Zekai Aksakalli led the operation. LTG Akasakalli had remained loyal to Erdogan during the coup and was later promoted to the rank of Lieutenant General. His Deputy, Brigadier General Salih Terzi was in operational command of Special Forces along the Syrian border before the coup. Terzi was allegedly involved in the coup attempt and was killed by pro-Erdogan security forces that night. The Turkish mechanized component deployed to Jarablus is meanwhile likely from the Second Army’s, 5th Armored Brigade, which is based in Gaziantep and deployable on short notice. The leadership of this mechanized component is unclear. 5th Armored Brigade Commander Major General Murat Soysal was detained after the coup attempt and his replacement is unknown at the time of writing. Erdogan’s confidence in the loyalty and capability of the Turkish Special Forces and Turkish second Army indicates his success thus far in consolidating the TSK under his own personal control without completely neutering its combat effectiveness. Turkey’s intervention in Jarablus is a turning point in American-Turkish relations and the war against ISIS. Erdogan’s willingness to commit military force to the anti-ISIS fight fulfils longstanding American demands for Turkey to increase its contribution to the anti-ISIS mission. The recapture of Jarablus and ongoing operations to clear remaining ISIS-held portions of the border west of Jarablus have set the desired conditions for an offensive to retake Raqqa city by eliminating ISIS’s final supply line from Turkey. The YPG’s decision thus far to avoid open war with the Turkish forces indicates that the U.S. may be able to refocus the YPG on the planned Raqqa offensive. The infighting between the joint Turkish-Syrian opposition force and the Sunni Arab components of the SDF is a major complication, however. American planning relies on the Sunni Arab component of the SDF to provide the bulk of the fighting force for the Raqqa offensive, because a YPG-led operation would likely alienate civilians in the Sunni Arab-majority Raqqa City. A prolonged clash between the SDF and the joint Turkish/Syrian opposition force would derail planned operations to retake Raqqa City. Turkey may now offer its own military support and that of Turkish-backed opposition forces for an operation in Raqqa as an alternative to the SDF, positioning Turkey as a major power player in northern Syria. 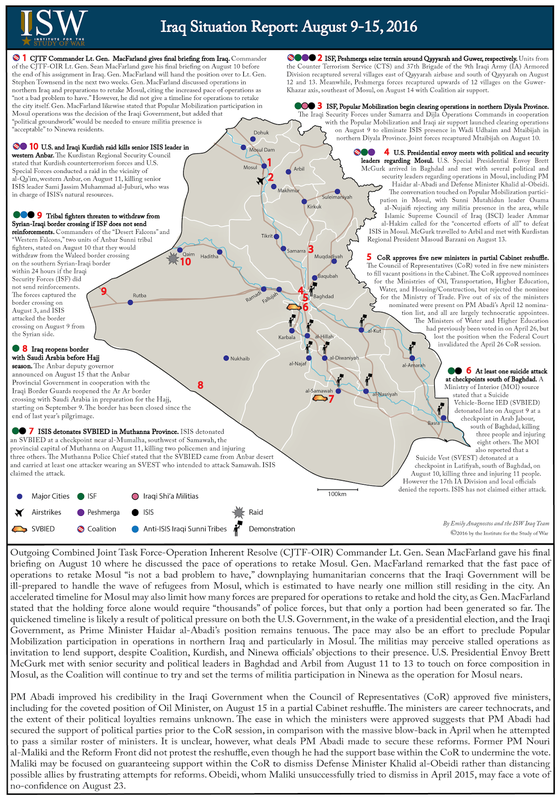 Outgoing Combined Joint Task Force-Operation Inherent Resolve (CJTF-OIR) Commander Lt. Gen. Sean MacFarland gave his final briefing on August 10 where he discussed the pace of operations to retake Mosul. 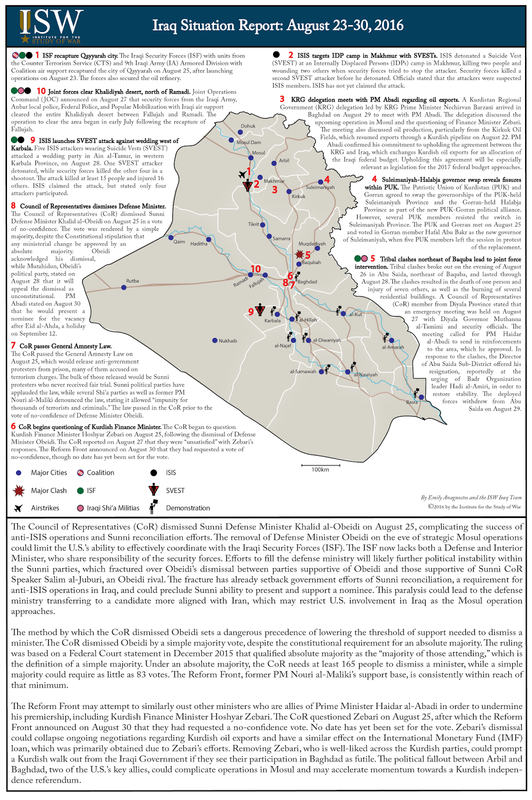 Gen. MacFarland remarked that the fast pace of operations to retake Mosul “is not a bad problem to have,” downplaying humanitarian concerns that the Iraqi Government will be ill-prepared to handle the wave of refugees from Mosul, which is estimated to have nearly one million still residing in the city. An accelerated timeline for Mosul may also limit how many forces are prepared for operations to retake and hold the city, as Gen. MacFarland stated that the holding force alone would require “thousands” of police forces, but that only a portion had been generated so far. 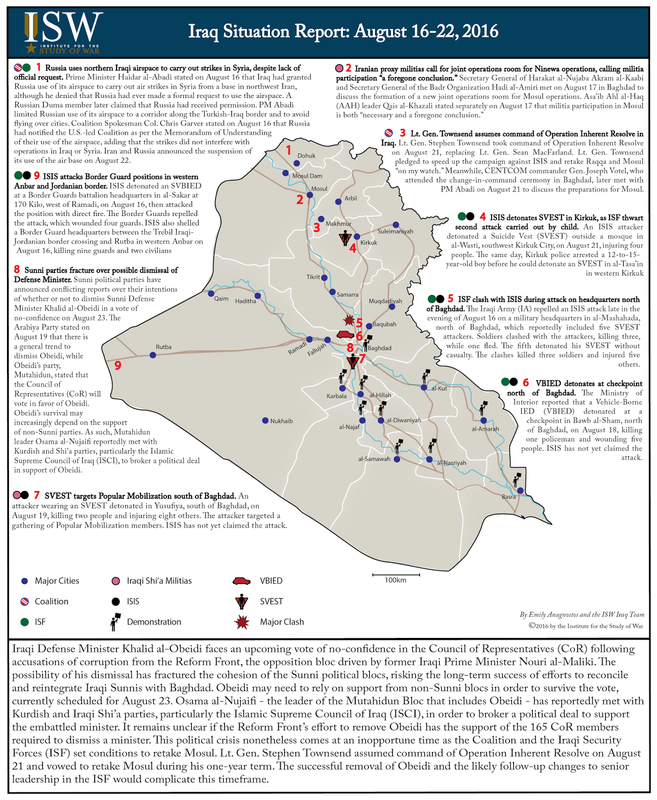 The quickened timeline is likely a result of political pressure on both the U.S. Government, in the wake of a presidential election, and the Iraqi Government, as Prime Minister Haidar al-Abadi’s position remains tenuous. 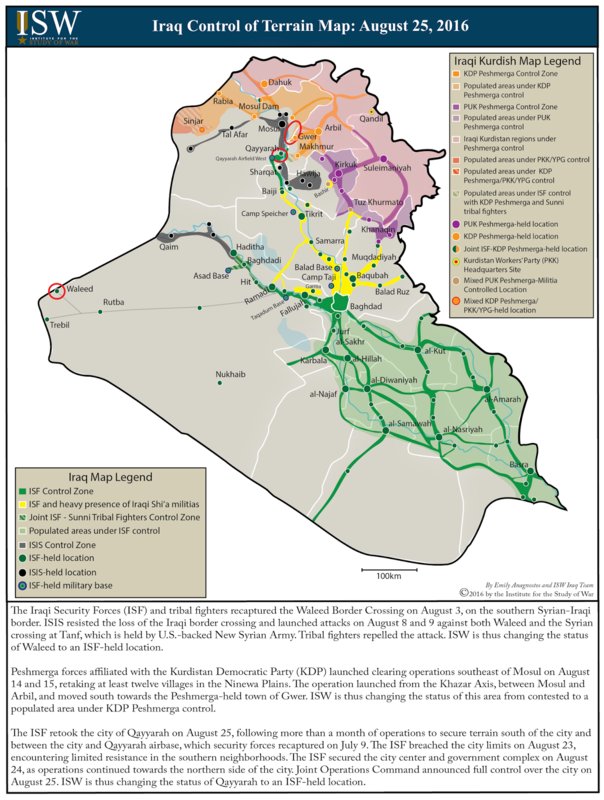 The pace may also be an effort to preclude Popular Mobilization participation in operations in northern Iraq and particularly in Mosul. The militias may perceive stalled operations as invitation to lend support, despite Coalition, Kurdish, and Ninewa officials’ objections to their presence. U.S. Presidential Envoy Brett McGurk met with senior security and political leaders in Baghdad and Arbil from August 11 to 13 to touch on force composition in Mosul, as the Coalition will continue to try and set the terms of militia participation in Ninewa as the operation for Mosul nears. PM Abadi improved his credibility in the Iraqi Government when the Council of Representatives (CoR) approved five ministers, including for the coveted position of Oil Minister, on August 15 in a partial Cabinet reshuffle. The ministers are career technocrats, and the extent of their political loyalties remains unknown. The ease in which the ministers were approved suggests that PM Abadi had secured the support of political parties prior to the CoR session, in comparison with the massive blow-back in April when he attempted to pass a similar roster of ministers. It is unclear, however, what deals PM Abadi made to secure these reforms. Former PM Nouri al-Maliki and the Reform Front did not protest the reshuffle, even though he had the support base within the CoR to undermine the vote. Maliki may be focused on guaranteeing support within the CoR to dismiss Defense Minister Khalid al-Obeidi rather than distancing possible allies by frustrating attempts for reforms. Obeidi, whom Maliki unsuccessfully tried to dismiss in April 2015, may face a vote of no-confidence on August 23. 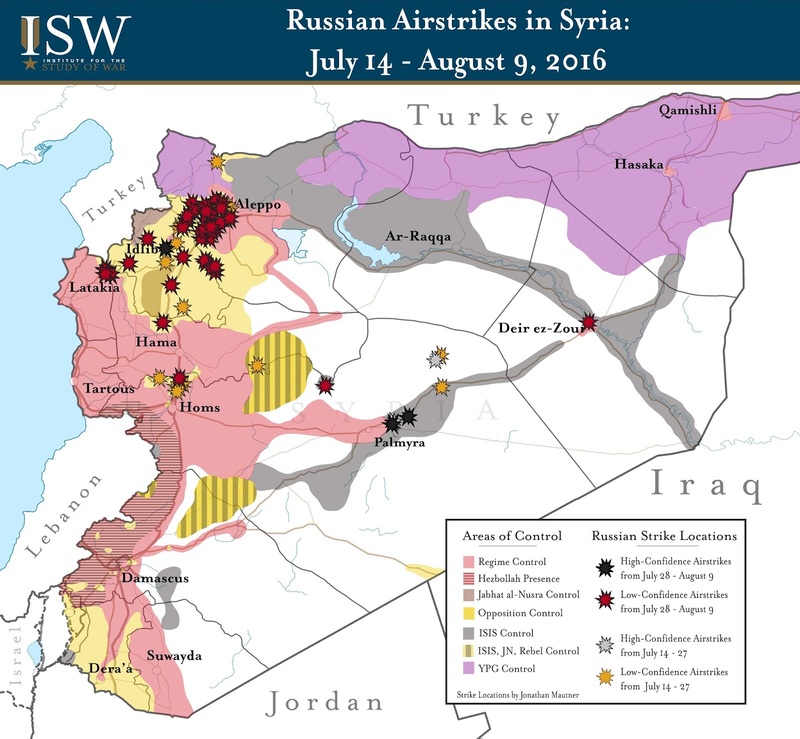 Read ISW’s analysis of the situation as of 10 AUG here. Russia intensified its air operations in and around Aleppo City after Syrian opposition groups lifted the regime’s blockade of the city’s eastern districts on August 6, demonstrating its continued commitment to bolster the regime in the Syrian Civil War. Russia continued to conduct strikes in Aleppo from July 28 – August 9 in support of the regime campaign to besiege Aleppo City and force the surrender of the primary stronghold of opposition factions acceptable to the West in Northern Syria. The opposition reestablished its ground line of communication (GLOC) leading out of the city on August 6, dealing a significant setback to Syrian President Bashar al-Assad in his attempt to capture Syria’s largest urban and commercial center. Russian warplanes subsequently intensified their airstrikes against opposition targets in eastern Aleppo City and villages along the M5 Aleppo – Damascus Highway in the southern Aleppo countryside, preventing civilians and humanitarian organizations from using the newly-established GLOC into the city. The targeted strikes also constrained the movement of opposition forces as they attempted to further consolidate control in the southwestern districts of Aleppo City. Russia’s continued use of air power against critical infrastructure and densely-populated terrain in Aleppo City follows U.S. President Barack Obama’s statement on August 4 that Russia’s “direct involvement” in support of regime operations to besiege the city has raised “very serious questions” about its commitment to a political resolution of the Syrian Civil War. 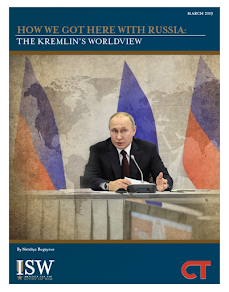 Russia continues to prioritize the pursuit of pro-regime military objectives despite a recent proposal for partnership with the U.S. against ISIS and al-Qaeda in Syria. Russia is likely to continue to wage its air campaign in order to bolster pro-regime forces attempting to encircle the city, the surrender of which would pose an existential threat to the viability of the acceptable Syrian opposition in Northern Syria. Russia also intensified its air operations against opposition targets in Idlib Province after an unidentified opposition group downed an Mi-8 Russian helicopter near the town of Saraqeb in northern Idlib on August 1, killing the five Russian military personnel on board. The downing of the helicopter marked the single deadliest event for Russia since its air campaign began in Syria on September 29, 2015. Russian warplanes conducted retaliatory airstrikes against several small opposition-held areas in the vicinity of Saraqeb from August 1 - 2 and targeted neighborhoods in Saraqeb from August 5 – 7. Local activist sources also reported that Russian jets dropped incendiary munitions while conducting airstrikes against Idlib City on August 7, suggesting that Russia intended to achieve punitive and deterrent effects against opposition forces in the province. Russia will likely continue to target core opposition-held terrain in Idlib Province in order to disrupt Idlib-based opposition forces massed in Aleppo. Russia also conducted airstrikes against ISIS-held terrain near the city of Palmyra in eastern Homs Province on August 7 following pro-regime deployments to Aleppo City from the Palmyra area. Russia likely aims to prevent ISIS advances against pro-regime forces in Palmyra as the regime is redeploying forces away from the area. Russian President Vladimir Putin has positioned Russian forces rhetorically and militarily to stage a large-scale operation in Ukraine. In response to claims that Ukrainian military intelligence staged an attempted infiltration of Crimea 07-08 AUG, Putin stated that Russia is obligated to respond. Putin cited this incident and a failed assassination attempt in separatist-held Luhansk 07 AUG as evidence that Ukraine is unwilling to settle the conflict in Eastern Ukraine through peaceful negotiation. Russia previously positioned troops and military hardware on Ukraine’s northern and eastern border, as well as in Crimea. Putin may use this incident to justify military escalation in Ukraine as an ostensibly defensive operation. Russia’s security service arrested Ukrainian security officials as they attempted to enter Crimea, which resulted in clashes on 07, 08 AUG.
Russia claimed that Ukrainian security forces attempted to enter Crimea on the night of 07 AUG with 20 improvised explosive devises and mines before being detained (link). Russian President Vladimir Putin warned that the purported attack on Crimea by Ukrainian military intelligence “will not go unanswered” (link). 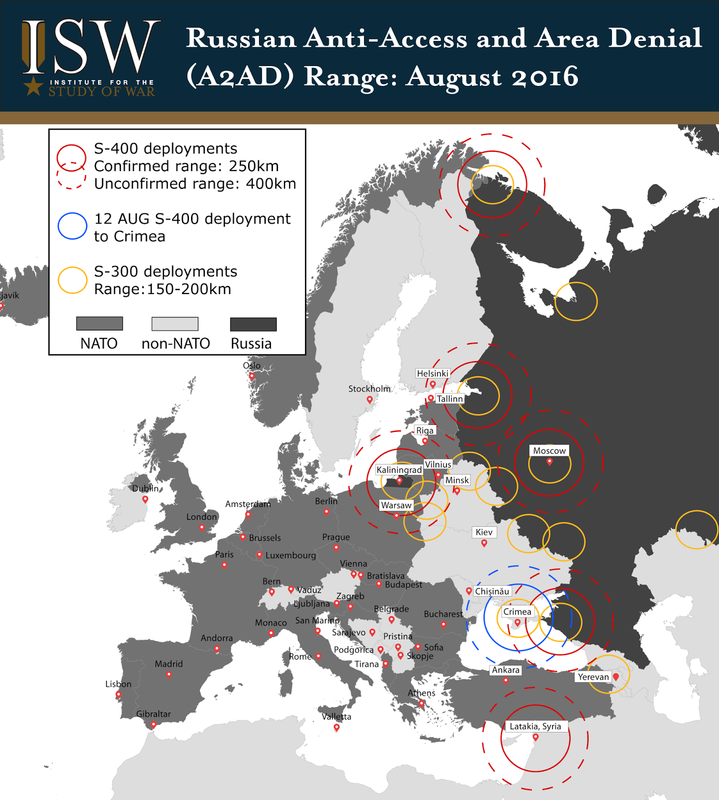 Russia has expanded its military presence to Ukraine’s south, east, and northern borders in recent months in an effort to draw out Ukrainian forces, possibly setting the stage for expanded operations. The 150th division near Rostov, which borders Ukraine to the East, will consist of 10,000 soldiers. Two other divisions were created in Smolensk, on the border with Belarus, and Voronezh, on the border with Ukraine. Russia may use this to legitimize escalating militarily in Ukraine while framing the escalation as a defensive measure.